I’d just like to say, when Juliet Marillier is good, she’s really good, and I’ve been having a nice run with her books lately. 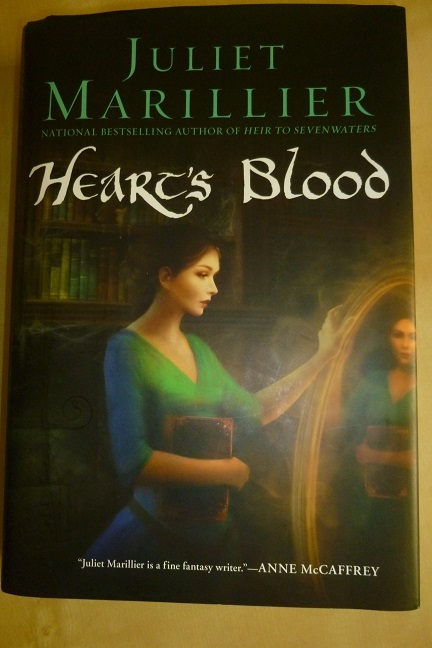 After recently reading Heir to Sevenwaters, I jumped into a reread of Heart‘s Blood, in part so that I could try to actually notice sooner this time that it’s a “Beauty and the Beast” retelling… It took me far too long to figure that out on the first go-around. The heroine of the story is Caitrin, who flees an abusive situation and, in desperation, seeks refuge and work as a scribe at Whistling Tor. There are strange rumors about monstrous spectres in the woods around the Tor, and about Anluan, the chieftain. Anluan proves to be bad-tempered and unfriendly; he was stricken by illness as a child and it left him semi-paralyzed on his right side. He nearly runs Caitrin off at once, but instead she stays, becoming part of his very unusual household and delving into the myserious curse afflicting the Tor. You probably already see some “Beauty and the Beast” parallels, and there are also enchanted mirrors scattered throughout. It’s really only “Beauty and the Beast” in the broad strokes, though, and most of the story focuses on deducing the origin of the curse, as well as on an outside threat from foreign invasion. This was an interesting one to read right after Heir to Sevenwaters, because it was once again two of my favorite archetype characters: a heroine who has to find her own strength and worth, and a dark hero with a heart of gold. That’s not to say, however, that Caitrin and Anluan are the same characters as Clodagh and Cathal. They have their own unique characteristics and paths to walk. Caitrin has a particularly difficult journey, overcoming abuse in her past. Marillier focuses less on the bruises and more on the psychological damage, which is deeper and far more complex. I ultimately found Caitrin’s path to be immensely satisfying. Anluan has different internal demons to overcome, and though we get less of his internal thoughts (Caitrin narrates, but we do get into Anluan’s journal) his development is intriguing too. The magic is spooky at times, creepy at others, and delves into questions of good and evil and the hazard of judging too quickly whether someone is one or the other. There’s a nice balance of character growth with unraveling mysteries and, as is usual for Marillier, the last hundred pages are breathless and hard to put down. I loved “Heart’s Blood”, though it was a harrowing read in places. So glad to hear you enjoyed it again on a reread. I hadn’t thought about the similarities with “Jane Eyre” (which I cannot spell today) at all, though. I might have to reread both just for that sometime. I have an akward relationship with Marillier’s books. I love so much about them — the details, the characters, the relationships, the world-building, the descriptions — but I can’t read them back-to-back. I get annoyed by the narration if I do that. 😦 I’ll just have to read her works very slowly! It’s great when you can find a book so good it’s hard to put down! Thanks for the recommendation. I keep meaning to read this author – I hear great things about her works. Spooky, creepy, good/evil questions – sounds like something I would definitely enjoy. She’s a great author! Wildwood Dancing is my favorite, if you’re looking for a place to start…or this one is very good too.